When we first found out that Baby Chew was going to be due in June, we were so excited to have a June baby! But of course our little one had plans of his own, and decided to come a little later, at 41 weeks and 2 days, which made him a little July baby. But we knew God had a plan because he chose his birthday at the right time - after all the things we needed to do, events we needed to attend, C's health and all... it was just perfect. Of course I definitely felt more and more uncomfortable as we progressed later into the pregnancy, but looking back, it was the best time he could've ever came. The thing was, we did feel a ton of prelabor symptoms for weeks, so we thought that it was going to come sooner than we thought. But it was our baby teaching us one of the many lessons of parenthood - surrender and trust, which we would learn so well in the first few weeks of his life. Believe me, before we hit our due date, I tried to prepare myself for labour so much, helping him to get into the best position, with all sorts of teas and exercises and whatnot. And once we hit 40 weeks, we were doing our best to natural help remind him, to come, but we knew we weren't going to be pregnant forever, so he had to come at some point. We were just hoping that we didn't need to be induced. In that time of waiting, I encountered this beautiful poem called Waiting by Robin James Gunn, that brought so much tears to my eyes. I try to arrange the plans of God. Isn't it beautiful? All the hormones and baby feels just brought all sorts tears into my eyes. Once we hit 41 weeks (July 5th), our midwife ordered a stress test and an ultrasound just to ensure our baby was doing great still. Thankfully, he was, but because in BC they typically will not allow you to wait past 42 weeks, so Baby Chew was scheduled to be induced on July 8, which was 10 days past his due date. Since July 8 was a Sunday, and C has treatment everyday on weekdays, we asked if we could move it to July 7 instead so that in the event the labour went long, C would be able to be around for this precious time. So, he was scheduled to be induced on July 7th. But on the morning of July 6th, around 6:30 AM, I woke up to what seemed like a contraction. It was about 30 seconds long, and it was mostly in my back. I knew it was different from all the symptoms I had experienced the past few weeks - mucus, occasional spotting, Braxton Hicks and a lot of cervix head-butting, because this pain was staying around! I also noticed a lot more fluid discharge, which I would find out that this was amniotic fluid leaking. After an hour or so, the contractions started to become more frequent and consistent, so I messaged my doula. She told me to keep her up to date, and she will head to me as soon as it's time, and she told me she is suspecting that it is amniotic fluid that is leaking because of the color and quantity it was coming in. Thankfully, C didn't have treatment this day because of some scheduling situation, so it was seriously perfect timing that he was around during my labour so he could help me, with encouraging words, pressure points, feeding and making sure I was hydrated, and just being my pillar of strength. At around 11:30AM, the doula was at our house. At that time, my contractions were already around 1 minute long and about 3-5 mins apart, and getting stronger. They had moved slightly from my back to my hips, and so far I was still managing with the pain with hot compress. When she arrived, we started using a TENS machine to help, and honestly it was good for distraction and I think it helped relieve some pain too. She also helped me get into different positions, to help the labour progress, as well as did some acupressure to help with the pain. It was really nice to have her and Clement there with me to go through the pain. By the time we hit around 1:00PM, the contractions were around 90 seconds long now and 3 mins apart, and the pain was escalating, so she said it's time we should head to the hospital and see where we are at. We put the bags in the car, thinking that this would be it! It was tough getting into the car and coming out, because every couple of minutes I would have a contraction, so it was the longest walk to the emergency ever. I recall that at the triage there was a dad trying to check the wait times because his son had gotten bitten by a dog, and he didn't know if he wanted to stay or not because he still had to pick up his daughter from school... and I'm like I'm in labour here! LOL I had to weather a couple of contractions as he took what seemed like forever at the triage. Finally, we got into the birth centre, and got assessed. And guess what. We were at 2cm. I was rather flabbergasted. The pain at this point was still manageable but I was starting to get tired, and I didn't know when it would get better. It didn't make sense to the nurses either as my contractions seemed strong enough and frequent enough, I should've been more dilated by now. So we decided that our course of action was to give me a shot of morphine, so I can go home and rest a little bit, and hopefully wake up more refreshed and more dilated. They also confirmed that my waters have broken / leaking, so we do have a 24-hr time limit as to when the baby will need to be born as the longer it takes, there would be higher risks of infection and what not. So, we were sent home. The pain was alleviated by the morphine shot, and I got to nap for a couple of hours. I woke up around 6 and was expecting that my contractions would be stronger by now, but I said maybe I'm just coming out of the morphine hence it wasn't that strong. After an hour or so, we phoned the midwife and doula and said that it hasn't changed much from before we went to the hospital, and so they advised us to go anyway because we will need to assess what's going on - we may need to induce to help the contractions progress better, and have access to pain medication just in case too. At this point, while I had envisioned a medication-free birth, I was open to anything since we started going over 40 weeks because the baby could've started to get larger and harder to push, and I was just willing to get the baby out safely no matter how it happened. Laughing gas - doesn't make you laugh but makes you a little doozy. We got to the hospital close to 8:00PM, and we were admitted because of my amniotic sac leak, even though I was around 4.5 cm dilated only - typically they would want to see more like a 6-7. So the midwife and the doula both helped me in various positions throughout the evening as we tried to help the baby go lower and get more in position. I knew that Baby Chase wasn't in an 'optimal' position before labour, he was on his side often and not really in a 'OA' position, which means he would be head down and facing me. Some babies don't do this until labour, but maybe because of the lack of room, he wasn't able to move in that position. I had tried so many exercises before birth to help ease him into it, and occasionally I would get him in a better spot, but he would quickly move back. It was really another example of me having to trust in God and baby that it was all going to work out, and I could only prepare myself so much. Anyway - thankfully he was slowly making it down and we finally got to full dilation sometime in the early morning, so we were able to start pushing. There was a little bit of my cervix though that kept getting stuck on his head, and every single time the midwife tried to push it away, I felt like my back was breaking. But pushing with that lip was futile, and we were not going anywhere. I had taken some laughing gas through this process, which was helpful, but in the pushing it wasn't really helping. So at around 5AM we decided to get an epidural so that I can focus on pushing without the intense pain whenever the lip was being pushed away and we were trying to bear down and push. They also gave me some pitocin to help with my contractions because they were getting more spaced out again and less strong. It really goes to show that unless the baby was in an optimal position, and your body was in the right position / shape - normal delivery would be challenging. I pushed for 4-5 hours with all my might. Baby Chew did not want to come out this way. I honestly didn't even feel that tired, I just wanted him out and was trying so hard. But at some point, his heart rate had started to drop, and we were a couple of hours past 6:30AM which would've been the time his amniotic sac had ruptured. We tried so many labour positions, dancing, walks and going up and down the stairs to help labour progress. We had to face the reality that it might end up with forceps, vacuum or a potential C section. I find it so ironic because just a few weeks back, C and I had this conversation about having a C section. 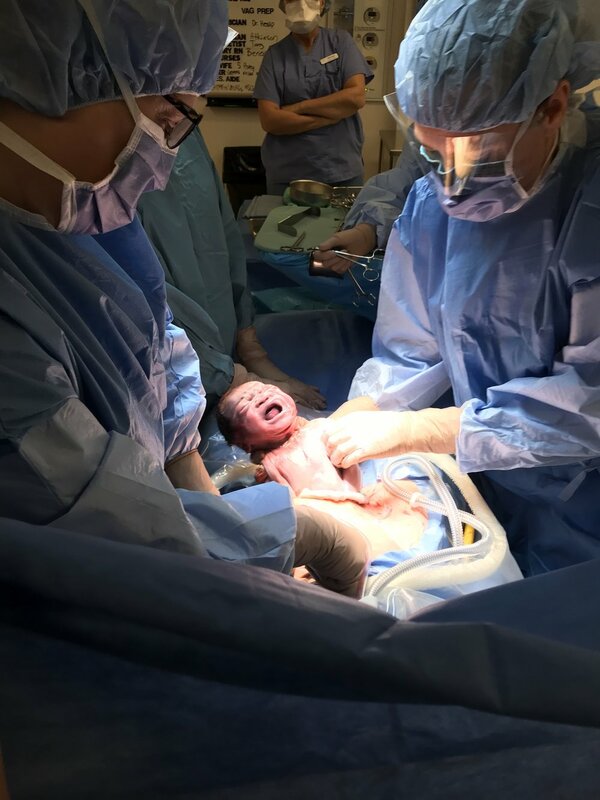 I was truly hoping it didn't have to get into there, because of all the things I learned about having a natural birth and all, and I had been doing so much to prepare myself for a vaginal delivery that I was just unwilling to accept a C section unless we had no choice. But after calming down from that discussion, I realized God was just preparing me for that lifelong lesson of surrender. Someone in my Facebook posted this beautiful article that talked about medical intervention being God's way of preserving life. Without them, so many babies and moms wouldn't be around today. So after that, I was definitely more open to it, especially after we hit the 40 week mark. In fact, I even asked about an elective C-section when they mentioned induction, because I just felt like it might end up that way instead. But it's tougher in Canada to get a C section without a medical reason, so we had to try regardless. Of course I hoped that we could deliver naturally, but at this point, I was open to whatever God would lead us. To be real though, I still cried when the OB gave me half an hour to see if we could help baby progress lower in order for her to even be able to use forceps or vacuum. And I cried even more when she came back an hour later, and said that we had to go plan B. On the birth stool, getting coached on pushing. I just felt that no matter what I did, no matter what effort I placed, it wasn't enough. Looking back now, it's my welcome to motherhood / parenthood for sure. He was simply not meant to enter the world this way, and that was okay. If this had happened centuries ago, in the middle of the woods, I would probably not have been around, or baby wouldn't have safely entered the world. It was truly a blessing that we had a way to get him out. So at around 11ish/12ish on July 7th, they started preparing me for C-section - they tapered off the oxytocin and increased the epidural for the surgery. They wheeled me in the room, C was dressed in the scrubs, and I was shaking so hard from the epidural. Once they knew I was numb in the right parts, they started the surgery and at 12:59PM, our beautiful son, Chase Noah Chew was born :) I heard his very loud scream, which we would hear a lot in the next few weeks, knowing that he was very much alive and kicking. Chase's first picture out of the womb! C got to put on Chase's first diaper and trim his cord. They placed him on my body, and I was so out of it honestly that I couldn't really hold him because I was shaking so much from the medication. Tears fell out of my eyes and we just thanked God for this beautiful miracle that was now here. I immediately noticed his beautiful head full of hair, his little dimple on his left cheek and he was just absolutely perfect. I asked C to just keep holding him because I couldn't hold on to him, but I was so grateful that he was here. We took some selfies and our very first family photo. Our birth story couldn't have been more different than what I had imagined, but it was all part of God's plan. It was a perfect example of Proverbs 19:21, "Many are the plans in a person's heart, but it is the LORD's purpose that prevails." And we were fine with that. I learned very quickly that I had so many advantages in our birth story too. I praise God that He gave me a healthy body that was able to recover from C-section surgery very quickly. Because I had gone through the whole labour, my body was able to produce the hormones and all the good stuff to prepare the baby for birth, too, as well as breastfeeding, than if I was induced. And because he didn't come out vaginally, I was able to preserve that part of my body too - I was able to sit up and stand without issues. I got to experience everything, and I know one day God will use our story for a reason too. And most importantly, baby was healthy, strong and was finally here. We were at peace with all that happened in it, and now we can focus on being present for our little child.